Welcome to the wonderful world of “toddlerhood”. Be prepared for lots of laughs, plenty of messes, and little ones constantly on the move! The Toddlers/Two’s class has a maximum enrollment of nine children with three teachers. This classroom typically ranges in age from 18-30 months. Our program focuses on encouraging independence, social interaction, group learning, and the joys of just being a toddler. 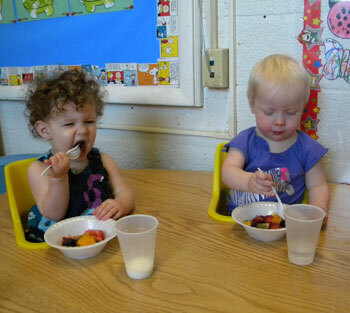 In addition we work with our toddlers on eating together in small groups, self-feeding using utensils and regular cups, participating in brief group times, and introducing them to self-toileting basics typically at twenty- two months of age. The indoor environment also includes books, dramatic play, art, music, sensory, and manipulative areas. Large muscle exercises take place indoors and outdoors. We frequently take neighborhood and use our outdoor playground facilities provide plenty of opportunities for running, jumping, hopping, balancing and zooming around with riding toys.